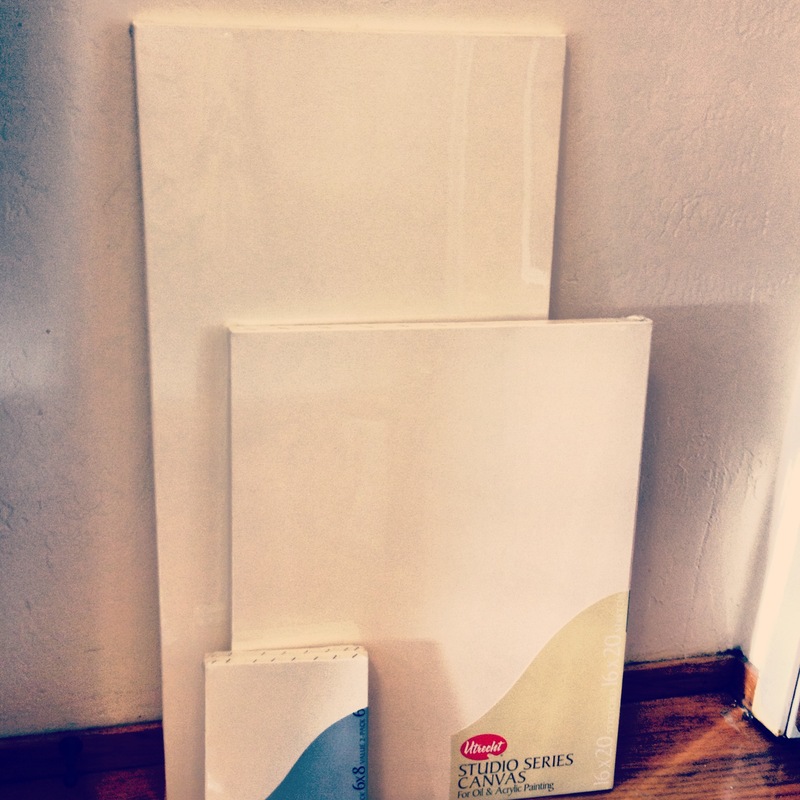 It all started with four blank canvases… so much potential! 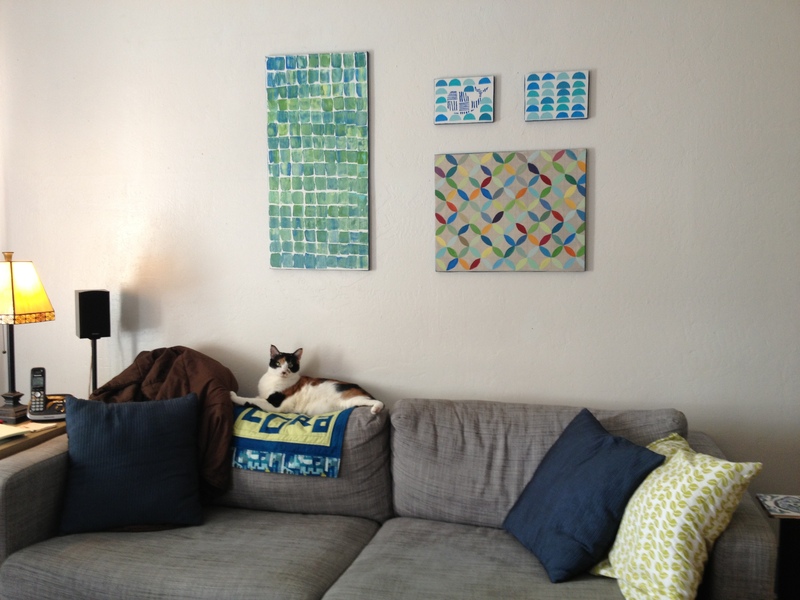 In one pintastic weekend, I filled the canvases and refreshed our living room art. I’ve been sharing each canvas in the past few weeks and I’ve drawn it out long enough – finally it’s time to reveal them all collected together on the wall. 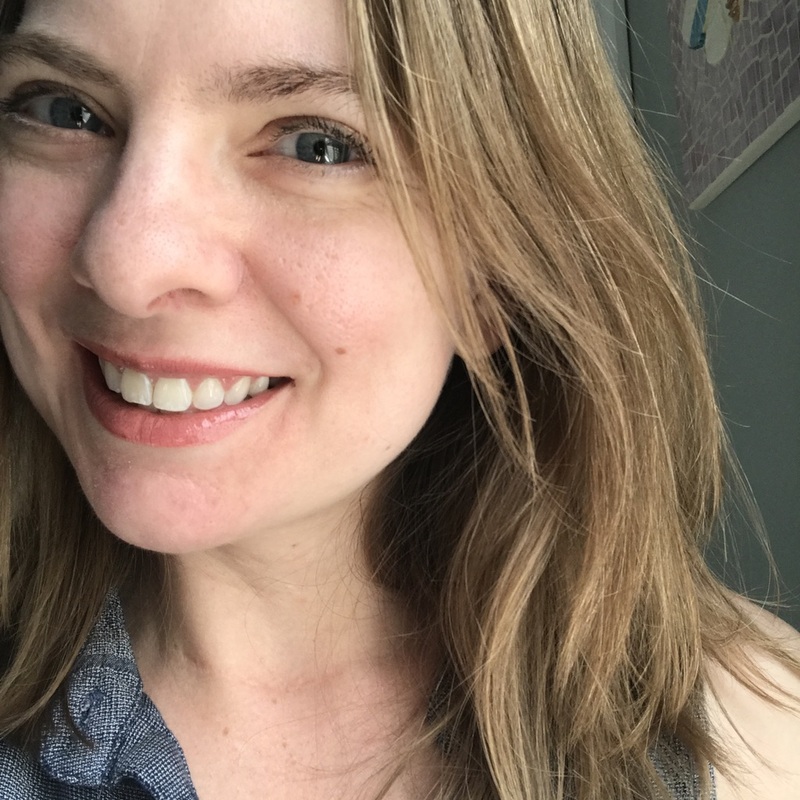 I love these prints by Kate Thomas at Little Things Studio, but the heavy brown frames were starting to feel a bit drab with the grey couch and white walls. 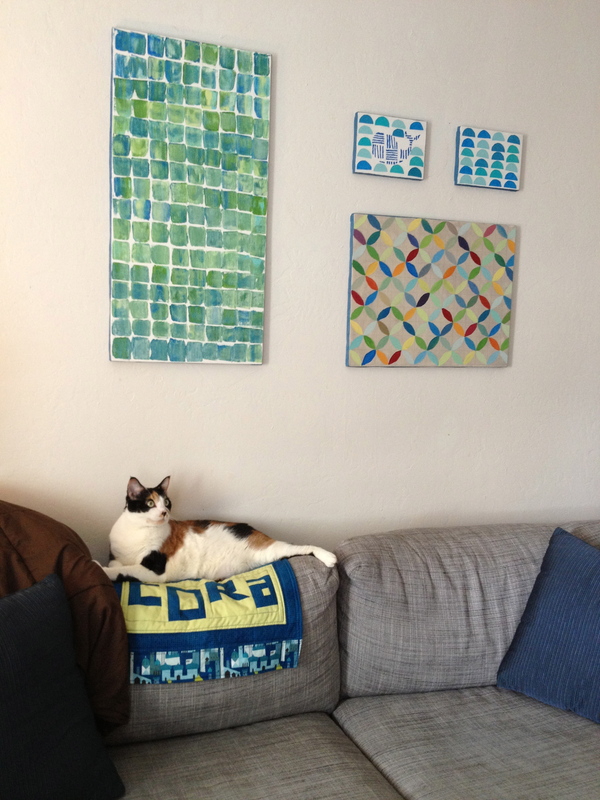 I’m still trying to find new homes for the prints – but I think I’ll be able to appreciate them more separately, when they don’t disappear above our heads while we’re sitting on the couch. 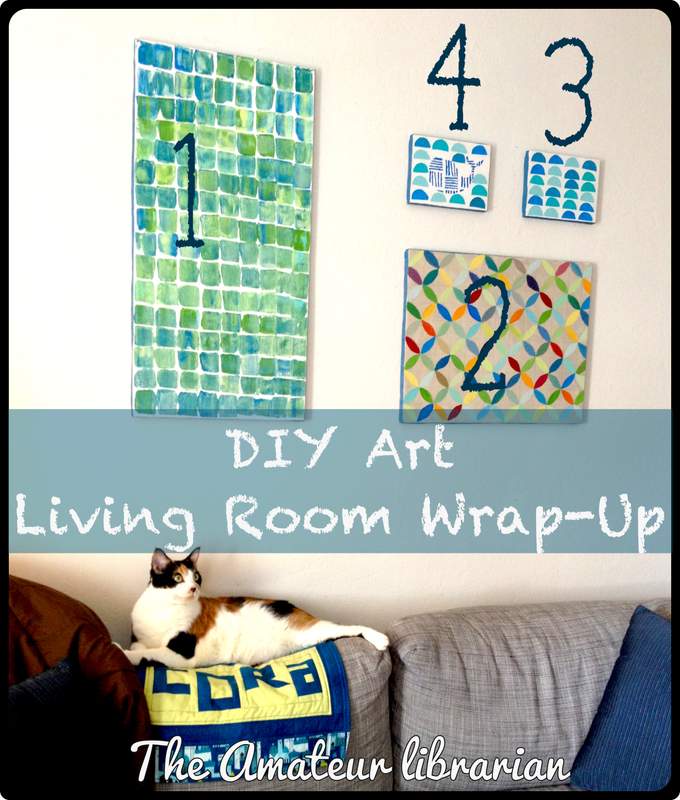 I really love my little collection of DIY art in a palette of blues and greens. I may or may not keep playing around with the arrangement and/or add more art, but for now I’m satisfied. Even Cora approves – she agreed to model her new cat mat while I snapped a few pictures. 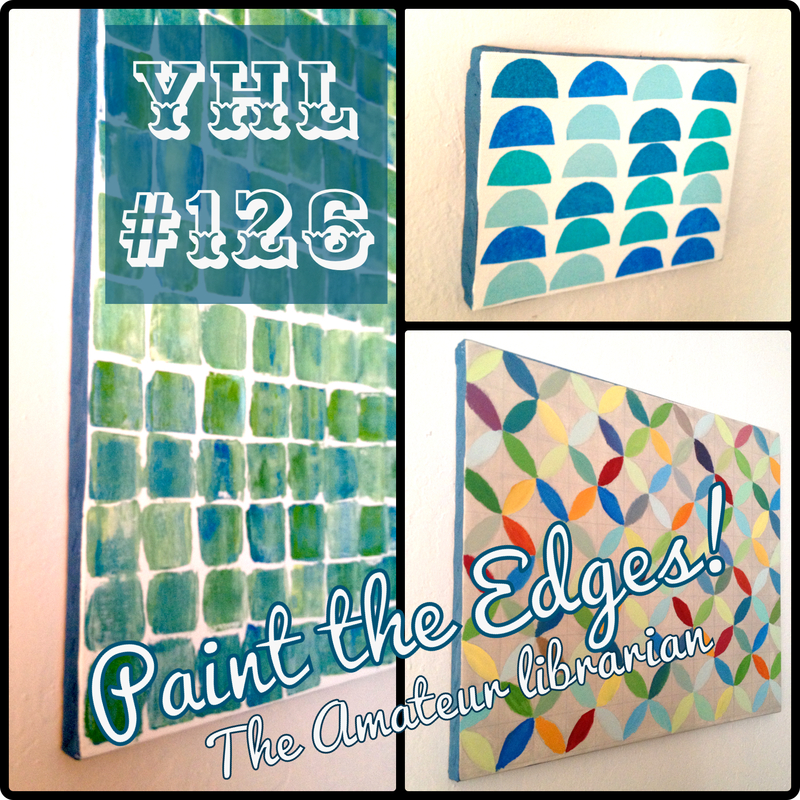 Before I forget, I used one more trick from Young House Love – Idea #126: Paint the Edges! (Remember how much I love the YHL book??) 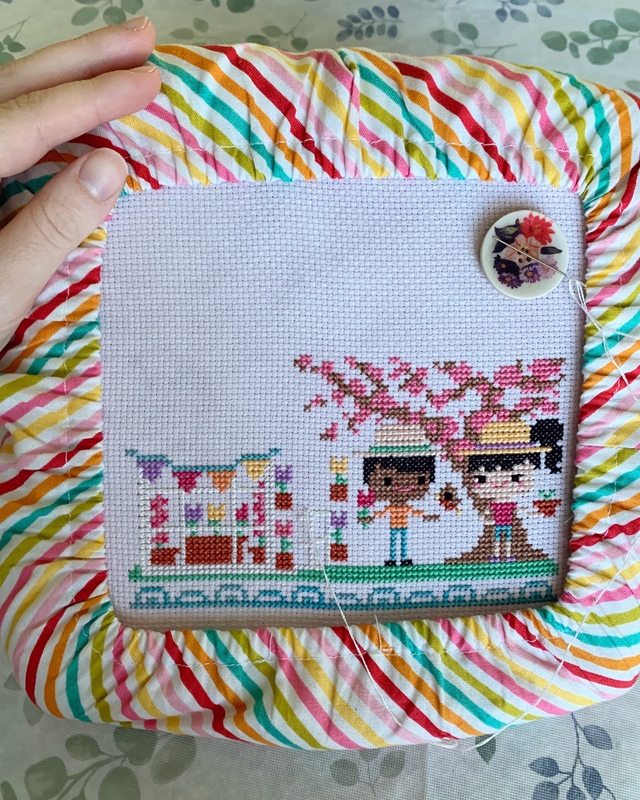 The book suggests painting the edges of a picture frame for a pop of color and interest – I translated the tip to my canvases and I love the effect! 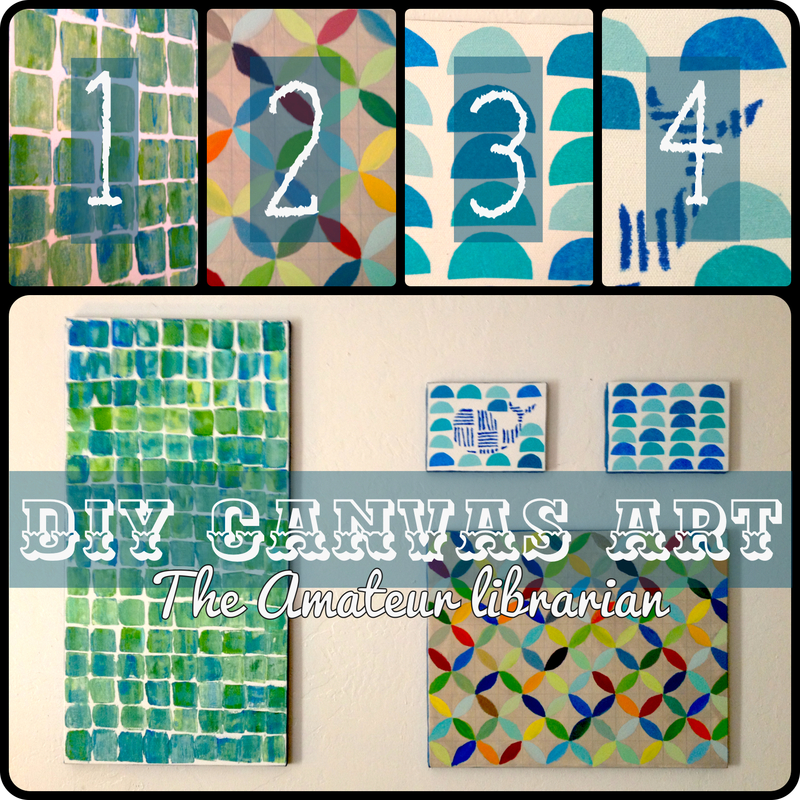 I didn’t want to frame the canvases, but this simple idea makes them feel more finished. 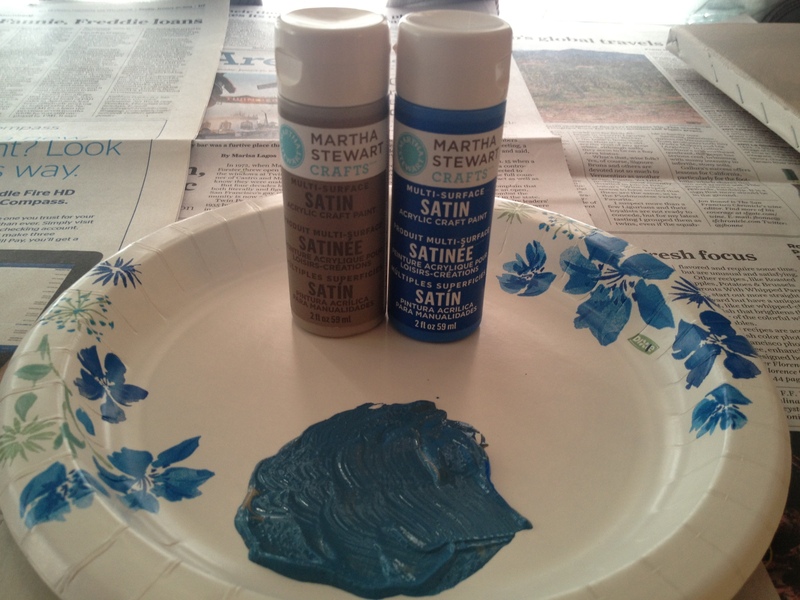 I mixed bright blue and brown to make a navy, and painted all the edges the same color. I think it helps make the different pieces more cohesive, and definitely makes the canvases look more finished by covering up the staples with paint. 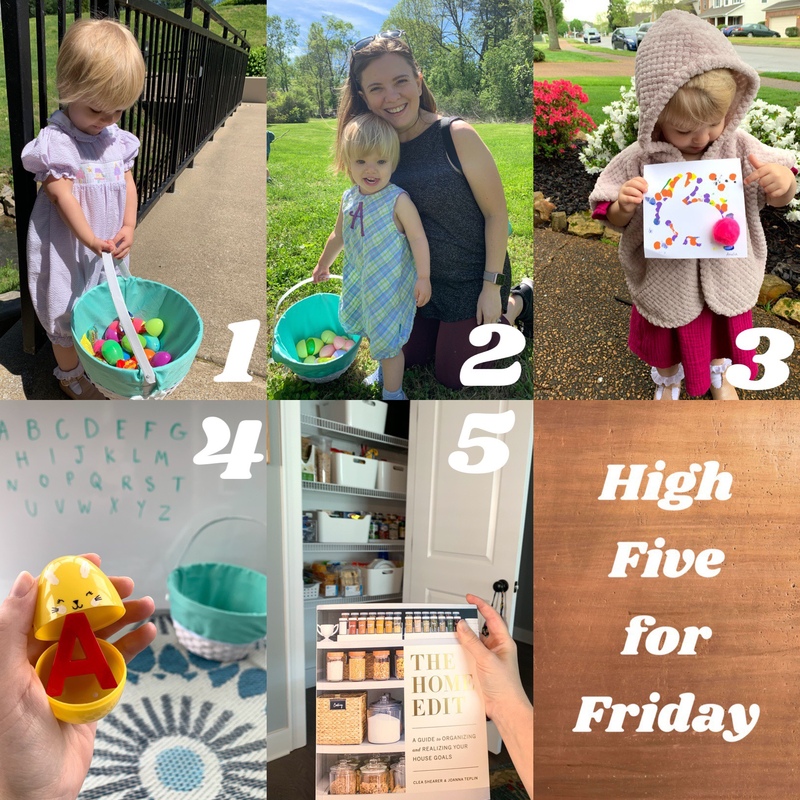 Check out each pinspired idea! 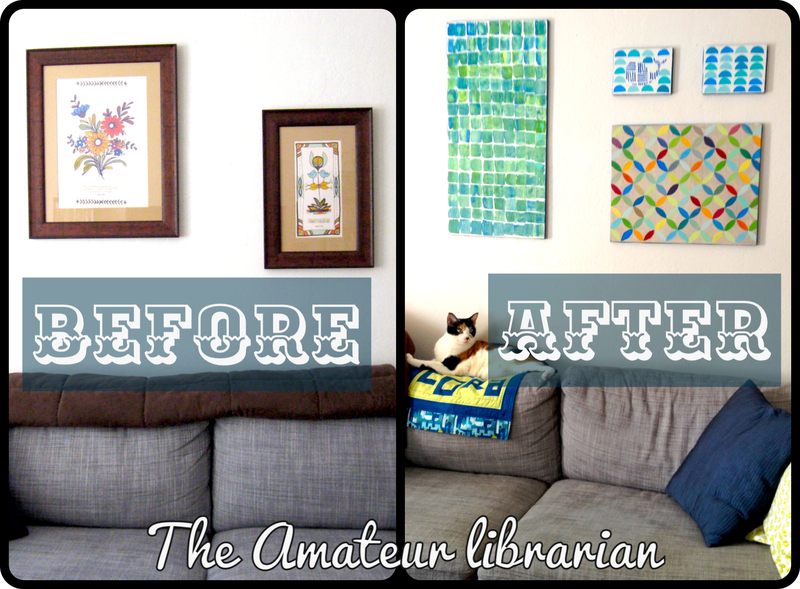 I’m super pleased to have more color in the living room, especially through art that I made myself! 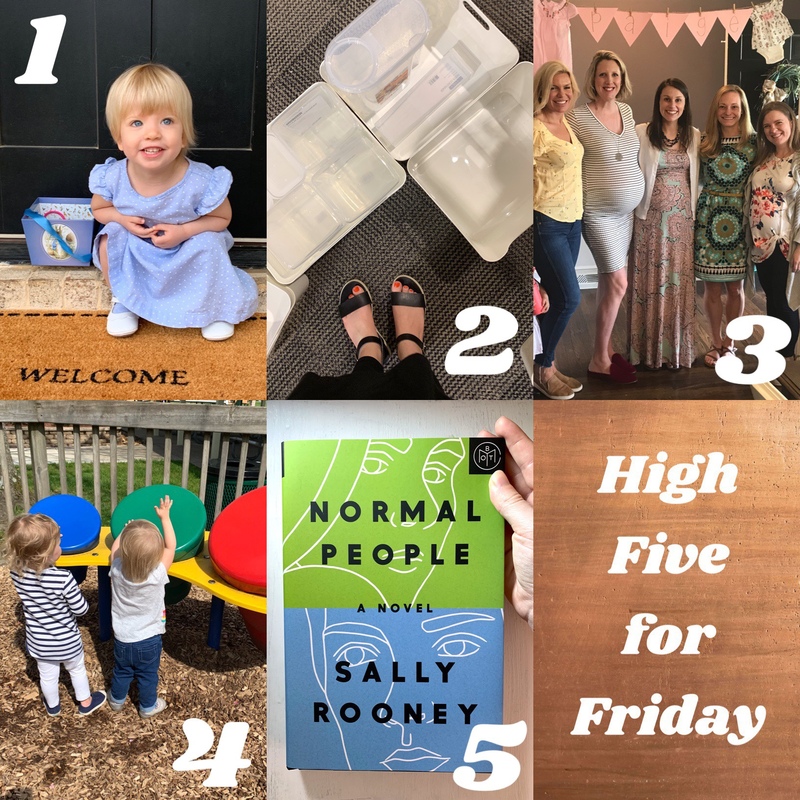 As usual, Pinterest has saved the day – four times over! Monday Funday, hosted by C.R.A.F.T.